As we age, the skin under our eyes becomes lax and fat from the cheeks descends into the middle of the face leaving semi-circular depressions. This often creates a tired look. This hollow area that runs from the inner eye margin to the upper cheek is referred to as a tear trough hollow. These depressions make the eyes look ‘sunken’ and cast unflattering shadows under the eyes often known as ‘dark circles’ that can give an impression of a weary, aged appearance. Soft tear trough fillers can be injected to bring these tear trough depressions back from the depths. 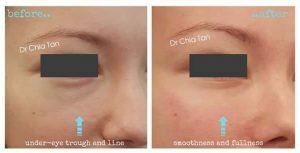 By lifting these hollow areas, it can take away the tired look and lighten the dark circles caused by the shadowing effect. The treatment is subtle but extremely effective. The overall result is that of a younger and fresher appearance. 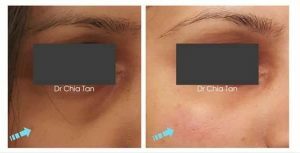 This is a revolutionary and non-surgical 10-minute eye-lift treatment that can rejuvenate your look with minimal downtime. The treatment procedure involves the careful introduction of a filler into the tear trough. That is then gently massaged into the target area to blend into the cheekbone and re-create the smooth, firm foundation for your under-eye area. 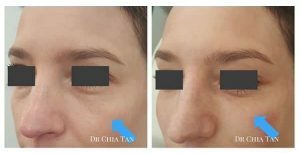 The soft tear trough filler consists of pharmaceutical grade hyaluronic acid that is similar to the naturally occurring hyaluronic acid found in soft tissue. It supports and hydrates the skin and is regarded as one of the safest fillers for use in tear troughs. It also treats the loss of infra-orbital volume. Hyaluronic acid based filler treatment is entirely reversible. This is possible when using an enzyme that breaks down and degrades the dermal filler within days. This is a safety net especially important for patients new to the dermal filler procedure. Topical anaesthetic cream is used for eye treatments prior to the procedure to ensure comfort. The local anaesthetic integrated within the tear trough filler ensures that the treatment is relatively painless both during and after the procedure. The procedure takes about 30 minutes and you will see improvement immediately. Cannula or needle method will be offered based on clinical indication to give you the best possible result. Swelling happens very infrequently, if it does, tends to be mild and usually subsides within a few days. Bruising is very rare especially with cannula approach, if it happens, tends to be tiny, therefore can be easily covered up with concealer or makeup. You can reduce the risk of swelling and bruising by avoiding exercise, alcohol, aspirin and ibuprofen prior to the treatment. 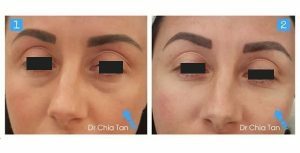 You will experience immediate lifting effect from the procedure, nonetheless the final result is usually in 2 weeks time; this is because fillers need time to integrated with the surrounding tissues to achieve hydration balance, and skin in the treated area also needs time to relax and smooth out. Say goodbye to tired looking eyes. Give us a call today to arrange a free, no obligation consultation to allow us to restore your confidence. Your skin is first cleansed & disinfected with topical numbing cream applied to ensure maximum comfort. It takes about 5-10 minutes to take effect. Local anaesthetic is integrated within all the dermal fillers used, to minimise any discomfort during and after the procedure. An ice pack or Arnica might be used to minimise local bruising. The procedure takes approximately 30 minutes on average. The lifting effect is immediate with minimum or no down time at all. final appearance is typically in 2 weeks time. If more fillers are needed, please allow 2 weeks between treatments. You cannot have this treatment during pregnancy or breast feeding. In individuals with known hypersensitivity to dermal fillers and similar medicine. Concurrent treatment such as laser skin resurfacing, microdermabrasion or chemical peels. Loss of vision is extremely rare, we are very experienced in tear trough procedure and all necessary precautions will be taken to ensure your safety. You can carry on with your day pretty much as usual immediately after leaving the clinic. Please avoid putting on skin care or make up on the treatment areas for at least 4 hours after the treatment. Book a complementary check up in 2 weeks time to review your progress and discuss other treatments. * "I sweat a lot. During summer it is always particularly embarrassing. The price is so reasonable and the procedure is relatively painless to say the least. I am so glad I found this clinic."